We are the Dixie State University radio stations, run by students, for students and the community. Radio Dixie 91.3 offers Alternative music, and HipHop and Rap at night, along with other specialty shows. Radio St George 100.3 offers Classical Music and Jazz. To get behind the scenes, sign up for MDIA 2380 or MDIA 3380 to learn the basics of radio broadcasting on real live FM radio stations. Any DSU student may sign up for the radio program with the instructor’s permission with an add card (Jennings 103). 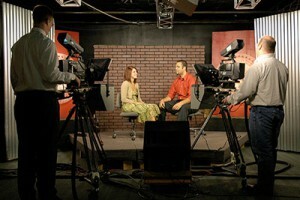 CEC is located on campus, operating as a not-for-profit government and educational cable access TV station broadcasting on Baja channel 22 and worldwide available by streaming. We represent St. George, Washington, Ivins, Santa Clara, Hurricane, the Washington County Commission, the Washington County School District, Dixie Applied Technology College, and Dixie State University. Four full-time employees work alongside faculty and students at Dixie State to produce many events, including high school and college sports, city council meetings, county commission meetings, and chamber of commerce meetings, and other cultural and special events. Tune in for “Southern Utah Chef,” “The New You” (with certified Pilates instructor Lorri Soqui), “A Story to Tell,” local sports, and more. Dixie Sun News is your source for Dixie State news, sports, opinion, and features. Dixie Sun News is conveniently available in print in buildings across campus, on demand at DixieSunNews.com and through the SUN News Mobile App available in both the Apple and Android app stores. DOCUTAH is presented by Dixie State University and reaches out to students and the community with filmmaker seminars and panels. Students and residents are invited to attend and learn more about the art of filmmaking and gain insight into the subject matter chosen for the film. Our tagline – Come for the films, stay for the scenery — invites festival attendees to witness the brilliance of the magnificent red rocks of southern Utah. The close distance to six state and national parks makes DOCUTAH a unique place to present a film festival. Documentary films engage our minds and have the potential to educate and entertain. Categories like music, environment and art lend themselves to us and we therefore plan events for the DSU students, festival attendees and residents of Southern Utah and beyond. DOCUTAH isn’t just a film festival… it’s a five day party and every event is one not to be missed. Legend and mythology state that Norsemen believed ravens sat on the god Odin’s shoulders and saw and heard all. Ravens are intelligent, playful, curious, observant, and creative. Ravens are also highly opportunistic and have learned to adapt to take advantage of whatever their environment offers. Thus, DOCUTAH gives out “The Raven Award” because these same traits are also exhibited by many documentarians as they create their films. Documentary film makers try to provide “the whole picture” of the subject of their film. Ravens are found throughout the world, thus representing the international scope of DOCUTAH. DOCUTAH will inspire a global connection through documentary films and intellectual discussion. In doing so it will enhance the education of students and citizens of the Southern Utah Community.